Our intimate relationship with wood and trees is as old as our species; after all for the majority of our time on earth ‘sticks and stones’ have been our highest form of technology; we are inextricably linked, our high tech lifestyle born out of sticks and stones. Wood has even helped shape our belief systems – from the stone-age rituals at Wood Henge to the ancient lore of the hazel tree in Celtic creation myths, to deities, like Odin hanging from a branch of Yggdrasil and Jesus on his hewn cross, wood has helped to granted us wisdom and given us faith. 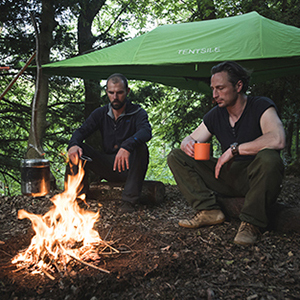 Working from a Robin Hood style forest basecamp, sleeping in Tentsile tree-tents suspended from trunks below a high canopy, Woodsmoke has access to some of the finest tree climbing locations in the Lake District National Park, from majestic oaks to twisting groves of rhododendron. Ben McNutt of Woodsmoke and Rafe Kelley and Ben Medder of Evolve Move Play have come together to give you this unique experience and combination world-class wilderness skills and natural movement instruction. 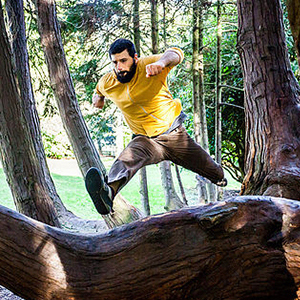 You will be mentored in the beautiful art of arboreal locomotion - tree-running, climbing, vaulting, roughhousing, strength and mobility training, brachiation and natural parkour. As well as learning how to move gracefully through the woodland environment, you will also learn about the art of chopping and stacking logs, the skill of shaping wood with simple hand tools, how to conjure fire by friction, how to forage woodland wild food, cook on wood fires, and banqueting on roast venison. You will also learn how to recognise the tracks of woodland animals and most importantly, learn about the individual tree species themselves; from lore to uses. Evenings will be spent unwinding at the spa, enjoying a sauna or steam and lounging in the outdoor hot tub, before retiring to the campfire for the evening.